Now, let's dissect this cutie patootie dessert. :) Its main part is polvoron, a common Filipino dessert created out of toasted flour, powdered milk, butter and sugar mixed together and then molded into various shapes, round and oval being the most common. 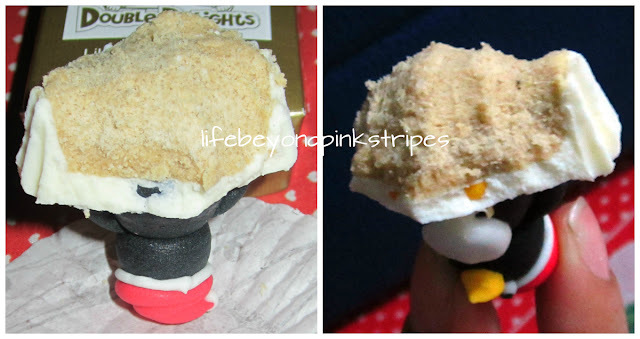 Double Delights made it possible for the polvoron to take the shape of a cupcake. 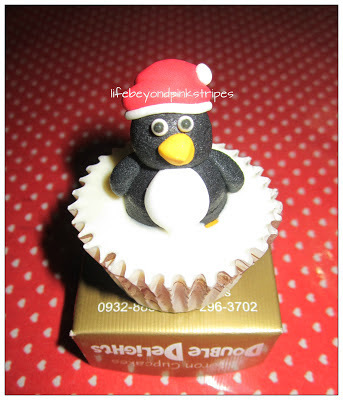 White chocolate covers the upper half of the polvoron and a penguin sugar topper completes the sweet delight. When I finally had this in my hands, I faced one dilemma ---> How to begin eating this thing? I decided to start from bottom to top, using the penguin topper as a handle. Surprisingly, its sweetness was just right. I actually expected it to be very saccharine but I was mistaken. Moreover, even with the white chocolate, I was still able to enjoy the distinct toasted taste of polvoron. After consuming the polvoron and the white chocolate, I took a quick look at the pitiful penguin and started biting off its head. I did not allow myself to be swayed with my emotions any further. LOL. I never taste it, but i think it's very delicious.... Right? How much is the cpcke polvoron?